Love, Lenore: 12 in '12. 1. & 2. My very first blog posts and still two of my very favorite looks. Check them out here and here. 3. This look has very special memories for me because it was featured on LaurenConrad.com, which was such an incredible honor! Check out the feature here. 4. This was one of my favorite posts of the year, mainly because of the stunning photography by Jo Johnson Photography. Check out the post here. 5. This outfit and the setting just came together perfectly in this post, and these were some of my favorite photos of the year (also by Jo - I mean, how great is she?!). Check out the full post here. 6. I love the fun colors and textures of this outfit, and I also think it's a really good example of my style. Full post here. 7. I styled this outfit in honor of Mizzou's 101st homecoming, so obviously black and gold were necessary :) Check it out here. 8. Burgundy and leopard are just such a classic, luxe pairing in my opinion, and this glam skirt from Target was such a steal! Check out the full post here. 9. This outfit didn't take any amazing styling skills by any means, but I'm just in love with this top! Full post here. 10. 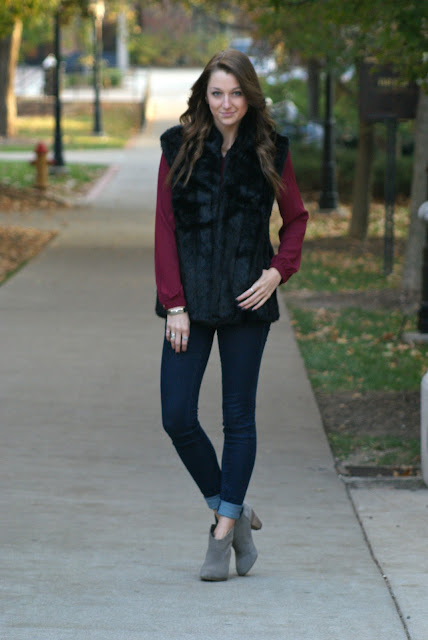 This was one of my favorite outfit posts because it I got to show off so many of my favorite fall trends ~ burgundy, faux fur, and booties! See the post here. 11. I've really enjoyed the army-inspired trend this season, and I wanted to do something unique with it, which I feel that pairing a utility jacket with a preppier striped dress achieved. Check it out here. 12. This was probably my favorite post of the year because I love this skirt and top, and also loved these photos by Jo. See the full post here. It's been an amazing first year of blogging, and I couldn't be more thankful to everyone who's helped me along the way ~ my readers, encouraging friends and family members, and everyone who I've dragged into taking photos for me this past year (Jo, Tessa, Trey, Ashley, Claire, Kate, Haley, Hannah, and even my mom and dad - you have all been such an important part of this!). I can't wait to see what opportunities 2 0 1 3 will hold, and I'm looking forward to sharing more of my style (& a bit of my life) with all of you! loved all the outfits.. few of them I would definitely emulate while styling outfits..
What a great post! Happy new year, Jacy! It's been great following your blog!! Lovely outfits, all of them! I especially like the first one, those boots are gorgeous! I love all these outfits! You had quit the fabulously stylish year! Such cute outfits, Jacy! Looking forward to your posts in 2013! Wishing you a happy, healthy, and successful New Year! Hope many doors open for you girlie:)! love most of your outfit! nice style you have! Wanna follow each other on GFC,FB,Bloglovin´? You've had such an incredible year and I've loved watching every step of it! Can't believe I've been here with you since the start, so amazing since you've been there from the start with mine too! Thank you so much for all your support and am so excited for this new year! Hopefully our paths will cross one day soon! Happy New Year gorgeous, wishing you all the very best for 2013! Beautiful review! You look amazing in all of them! Gorgeous, gorgeous, gorgeous! I think #6 was my very very very favorite! I love your style, its so feminine and cute, but you put your own twist on your outfits, but I must say, outfit number 7, the black and gold if by far my favourite, so stunning. So many incredible looks, Its hard to pick a favorite, your style is incredible. I love love the first look and the burgundy top with the leopard skirt, two major stand outs for me from a group of exceptional outfits. Stopping by to wish you a Happy New Year Ladycakes! Wishing you love and big smiles in 2013. What a great year you had and great fashion you post on you blog. If you get a sec, checkout my latest post New Year and Sequins. These outfits are all so pretty Jacy! I especially love outfit 12, the top is such a beautiful color and I love the print of the skirt :) Happy New Year! you had a very well dressed 2012! cheers to the new year! Gorgeous look. That dress is so pretty on you! I love seeing all these pictures, since I recently started following your blog these last two months! I love all of these looks! Such cute style!